Also, whatever happened to this book? It doesn’t show up on any searches. I was gifted unexpectedly with a copy of “Untie the Strong Woman” on 12/31/11 by a cousin. Unknown to her, the book was on my wish list. I have reread “Women who run with the Wolves” several times over the years. The mystic archetype in me has been gestating and I wish to thank you for the “birth” of Mother Mary. Many books pass across my eyes, some end up in my reference libray to be read multiple times. UTSW is one of the latter. Mother Mary sings to me here. 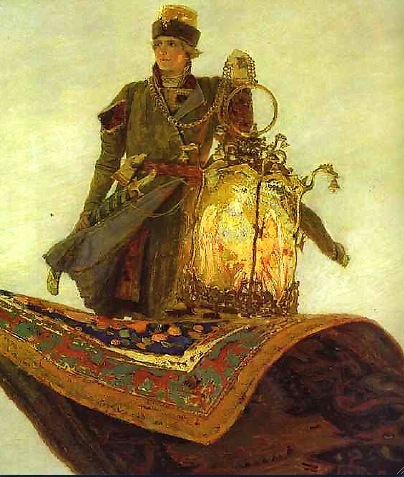 Who is painter and what is the name of the painting of the man on the flying carpet with the lantern that appears on your “My book to/for Men”?